The American Cowboy has long been a heroic figure throughout the world standing tall and proud in the face of adversity with honesty and integrity. My grandfather was one such man who valued his earthly calling as a cowboy, a husband and a father, guided always by the unchanging principles of God's Word. 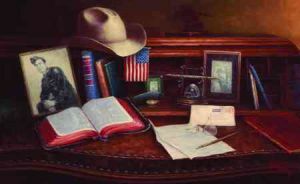 When he finally removed his Stetson at the end of the day he often sat down at his rolltop desk, and with quill in hand, offered words of encouragement to his frightened young son giving his all with his comrades fighting to protect the freedom of our great nation. We received many letters from my father from remote European battlefields during World War II. Pray for our troops. While words don't often come easy for a cowboy, this was one time his love for his family, his country and his God truly defined his life as the "All American Cowboy." 750 S/N Giclee's - available in larger sizes as well.